Home Infinix Smartphone specs Smartphones Infinix Hot 5 and Hot 5 Pro Specifications, Price, Features - Leaked ! Infinix Hot 5 and Hot 5 Pro Specifications, Price, Features - Leaked ! 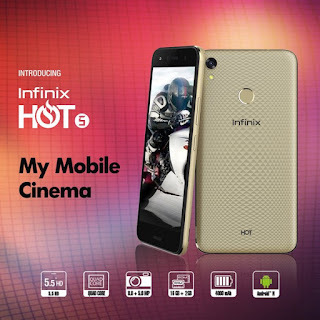 Infinix Hot 5 Lite and Hot 5 (pro) features has almost the same specs with its predecessor, Infinix Hot 4 and Hot 4 pro. The Hot 5 Lite and Hot 5 (pro) both run on Android 7.0 Nougat using infinix XOS Chameleon powered by a MediaTek Quad-core processor. The infinix Hot 5 pro is built with 2GB of RAM (1GB RAM for Hot 5 Lite) and 16GB of internal storage . There are rumours that these mobile phones will retain the 5.5inch display of the Hot 4 pro but will get better resolution or display (1080 * 1920) and will also retain the finishing of its predecessor. Just put that the Hot 5 is just a direct upgrade of Hot 4 pro. Wow this brand smartphone specs are not too OK but its fairly cool.. Most especially the finger print.